Thank you to everyone who played along with us last week for our big birthday bash! 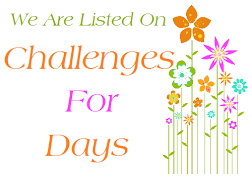 It was so much fun for us to see you having fun with all the challenge theme possibilities. The gallery looks absolutely amazing! we will be posting our Happy Hour on Saturday. CFC101-This week is a technique challenge. We'd like to see your Clean And Simple creations that feature stamping on designer paper. We are thrilled about our brand new May release! 5 incredible new sets are now available in the store! The Girl Fridays are all getting inky with CAS-ual Fridays Stamps this week! Tricky! (At least for moi). The DT examples are fantastic. Hmmm...you made me look at all my DP in a different light. Thanks for the inspiration.